There’s nothing quite like packing up your life, stuffing your dogs, boyfriend and some luggage in a small vehicle, and proceeding to drive for 7 days. 3,4000 kilometers down, 500 to go on our Cross Canada (turned Cross United States when we realized just how huge Ontario was) adventure from Montreal Quebec to Calgary Alberta. Trenta (31oz!!) Starbucks Iced Green Tea, no water, light ice, no syrup, with 1 cup Valencia Orange Refresher, to be exact. 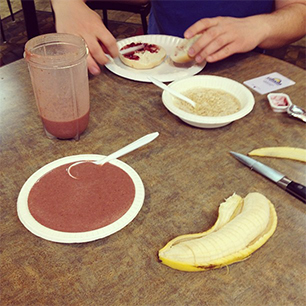 Caffeine aside, Kevin and I have been making really health conscious, awesome choices on this adventure of ours. It’s not easy to eat healthy when you’re living out of a suitcase, have access to free continental breakfasts and cheap fast food. Did I mention all the candy at the gas stations? Ah! Driving times in the double digits or not, I’m happy to report that we haven’t done the fast food thing at all (!) and no candy has been purchased. 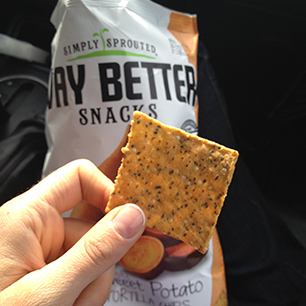 I found these sprouted sweet potato tortilla chips in Tobermory, Ontario and had them as a snack on the ferry. They’re loaded with good things like chia seeds, sprouted quinoa and sweet potato. The best part? They taste like Sun Chips… but they’re gluten-free! When there are hours between one town to the next, and eating out just doesn’t interest you after day 5 of being on the road, a can of tuna with loads of fresh veggies starts to look pretty darn good. 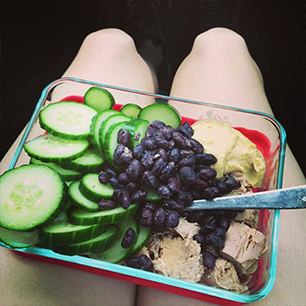 This lunch had hummus, black beans, cucumbers and tuna stuffed into my awesome Pyrex container. Instead of paying upwards of $20 for a boring salad at a restaurant, we went to the grocery store and each picked up our own small tubs of lettuce mix, veggies and protein. The bill came to $12.97CAD. 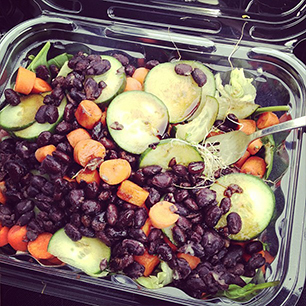 Once we got to a quiet picnic spot, we used the lettuce tubs as ‘bowls’ and loaded our salads with our fixin’s. I’ve been whisking eggs in the morning in my circular Pyrex container, microwaving them for 3 minutes, placing them in the cooler and having the cooled omelet with veggies for lunch. 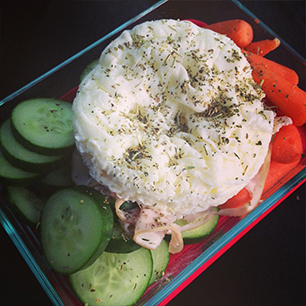 This plate was packed with cucumber, chicken and carrots. Mixing quinoa flakes (or quick oats) with egg and applesauce makes a fabulous, high protein, breakfast. My Apple Cinnamon Quinoa Flake Bake recipe is the simplest of my quinoa flake bake recipes. 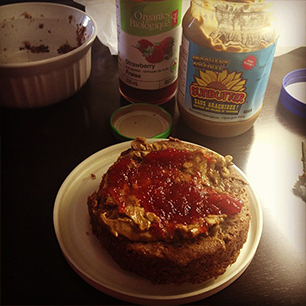 It can be made 100% vegan by using all apple sauce, or add additional protein by subbing out some of the applesauce for egg. We stopped at my cousin’s house for a gourmet meal, Flintstones style, and had a fabulous visit (plus amazing breakfast the next morning!). Sweet Desserts You Can Be Proud Of. 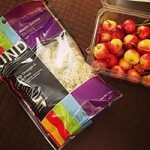 It was either a pack of Tootsie Roll Dots, or KIND Maple Quinoa Granola with cherries. I chose the granola and cherries. Still, just as sweet and delicious, but without the sugar rush. Yay! 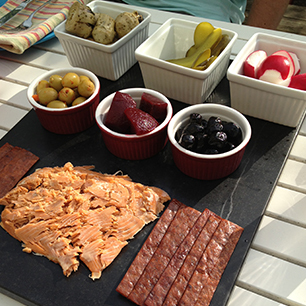 Another cousin sleepover favorite – a snack plate made up of salmon, jerky, olives, beets, pickles, radishes and artichokes. 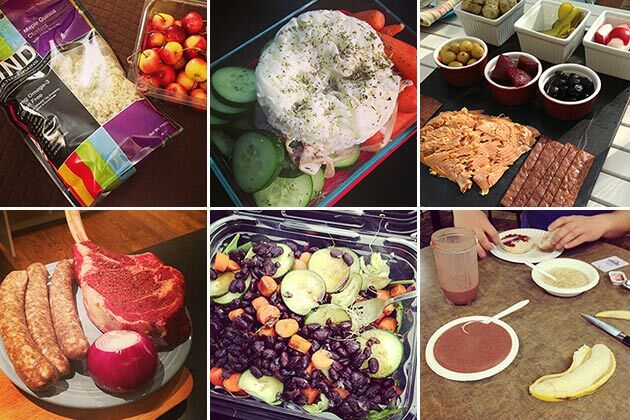 A little taste of everything goes a long way. I brought my little Magic Bullet with me on this trip and am so thankful that I did. I’ve been blending up fresh fruits with water, ground cinnamon and vegan protein powder daily. Topped with some banana, hemp seeds or gluten-free cereal and I’m a happy touring Canadian ? What’s your guilty pleasure? You know mine… what’s yours? 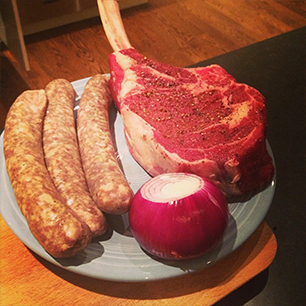 PS: We’re all human… it’s normal to indulge. No sweat, no judgment. Just fun.